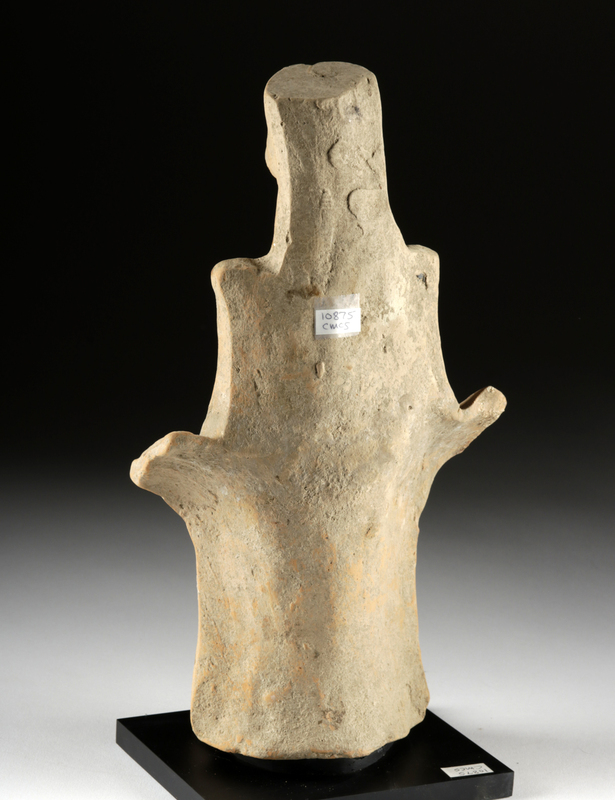 Western Greece, Rhodes, Archaic period, ca. 600 BCE. 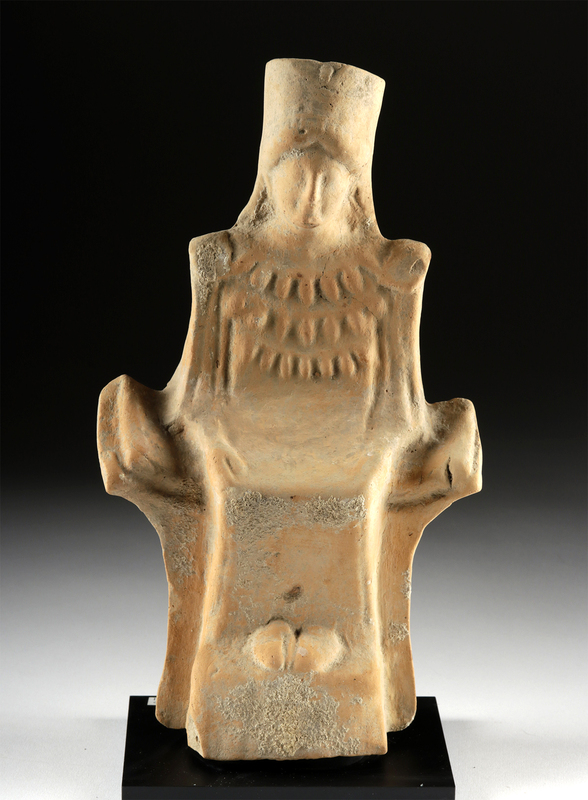 A beautiful hollow-cast pottery statue depicting an elegant female figure seated upon a tall, integral throne that flares outward at the sides. 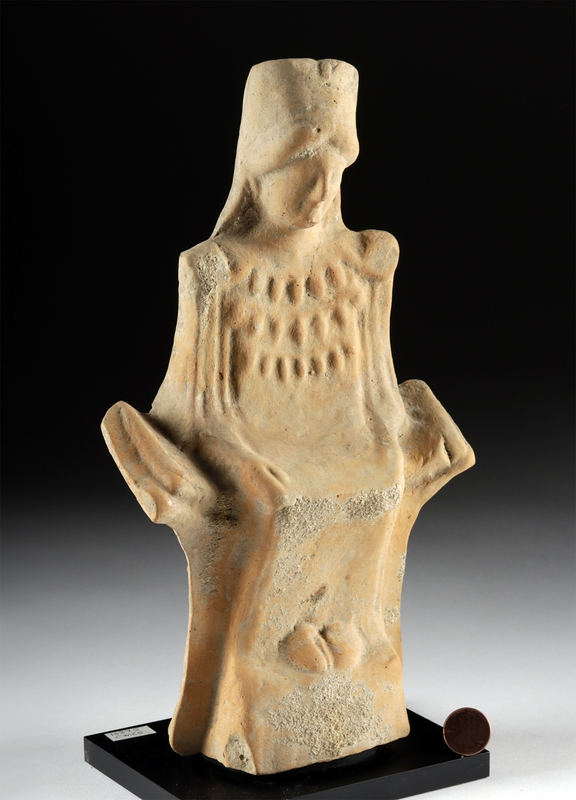 She wears an ankle-length himation with both hands resting upon her thighs. 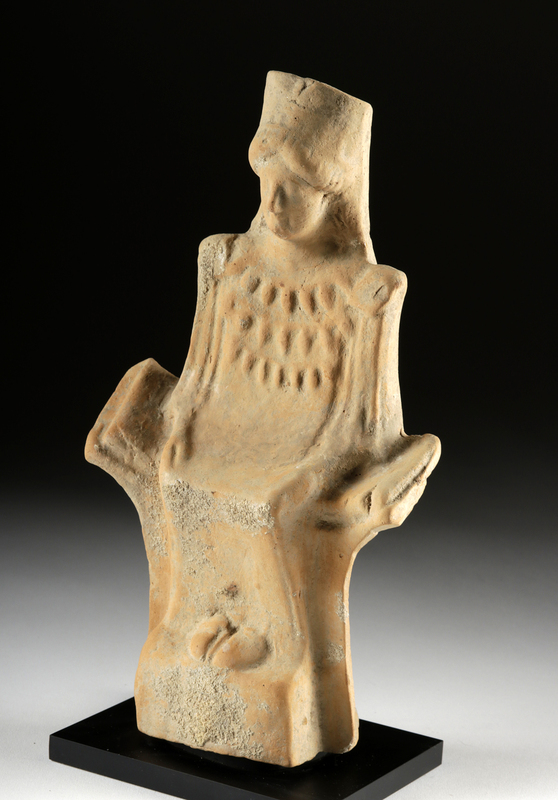 She seems to have a series of necklaces or a decorated tunic covering her upper body. Her face has worn with time, but her delicate nose and signature Archaic smile are still present. Although the exact significance of this smile is unknown, scholars suggest that the ancient Greeks associated it with good health and well being. Atop her head, she wears a tall, round crown with her hair underneath it, center-parted at her hairline. Size: 5.75" W x 10.45" H (14.6 cm x 26.5 cm); 11.1" H (28.2 cm) on included custom stand. By the seventh century BCE, Greek art began to evolve from its embrace of geometric patterning, which was favored between approximately 1050 and 700 BCE, to a desire to create more naturalistic representations of the human figure. Most famous are the freestanding sculptures of two main types, the male standing youth known as a kouros, and the draped standing female kore. The earliest examples demonstrate an Egyptian influence in both pose and proportions, but over time sculptors created even more lifelike representations. These were placed in sanctuaries as well as cemeteries and served as grave markers and dedications to the deities. Protomes like this example demonstrate these developing naturalistic leanings of Greek visual culture as well, with that Archaic smile signifying life and representing the Archaic ideal. They would have been dedicated in an ancient temple to the local deity, perhaps to thank the god or goddess, or to assist in making a request. Condition: Repaired at center, with overpainting along the repair lines. This is well done and almost impossible to see. Nice encrusted deposits on surface and preservation of form.